Salad or Asian specialties flavored with flaxen oil? Delicious! But be careful – the quality of oil depends on the way of processing. We will show you how to prepare the high-quality oil at home. We distinguish hot and cold pressed oils. Common oils are hot pressed, which means that seeds are warmed up to be softer and therefore you squeeze more oil out of them. But heat unnecessarily destroys a lot of beneficial substances. That’s why you get lower quality. In the process of hot pressing there is a huge loss of both taste and beneficial substances. And that’s a pity, because more and more studies have proved great nutritive value of seed oils. You can try better way! If you cold-press seeds (the temperature of 42˚C is not exceeded) it takes a bit longer and you have to process more of them, but you get high-quality oil full of vitamins and minerals. Thanks to above-mentioned features cold-pressed oils should be important part of your menu. According to researches you should have a spoon every day. The best thing about cold-pressed oils is that you can prepare them at home. Are you interested in preparing your own oil? 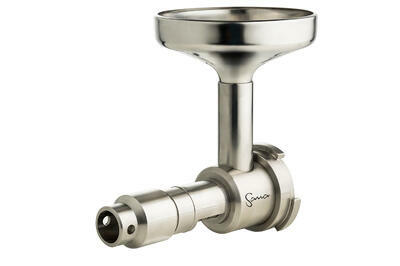 If you own Sana Juicer EUJ-606 or Sana Jucier EUJ-707, you can try it right away. There is a brand new stainless oil extractor, which you can use as a complement to your juicer. And don’t worry you can clean it in the same easy way as you’re used to. Oil Extractor Sana enables you to press fresh oil from different kinds of seeds (e.g. flax, sunflower or sesame). Thanks to cold pressing method there’s a guarantee of delicious taste and preservation of beneficial substances. What can you start with? Try flaxseed or sesame oil. The concentration of oil within seeds is about 40 % in case of flax and 60 % if it comes to sesame. You have to count on the fact that you need a couple of kilograms of seeds to get 1 litre of oil. If you’d like to prepare your own flaxseed oil we recommend consuming it right away. You get the best taste just for a couple of days. Flaxseed oil is one of the oils with the highest nutritive value in the world. Even though flaxseed is not cereal, it has almost the same amount of vitamins and minerals. But in terms of roughage, antioxidants and omega-3 fatty acids it’s far healthier. Old Greeks already knew its wholesome effects. Hippocrates used it as a remedy against problems with mucous membranes. But even today you appreciate its ability to improve your digestion and women can use it to reduce menstrual cramps. 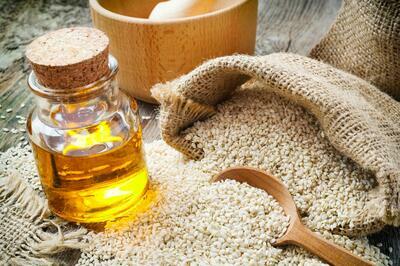 Sesame oil contains a lot of mono unsaturated fatty acids and omega-6 fatty acids. It lowers the level of cholesterol in blood and it’s very beneficial for people with heart diseases. High content of vitamin B, magnesium and phosphorus makes it a great remedy against bad mood.